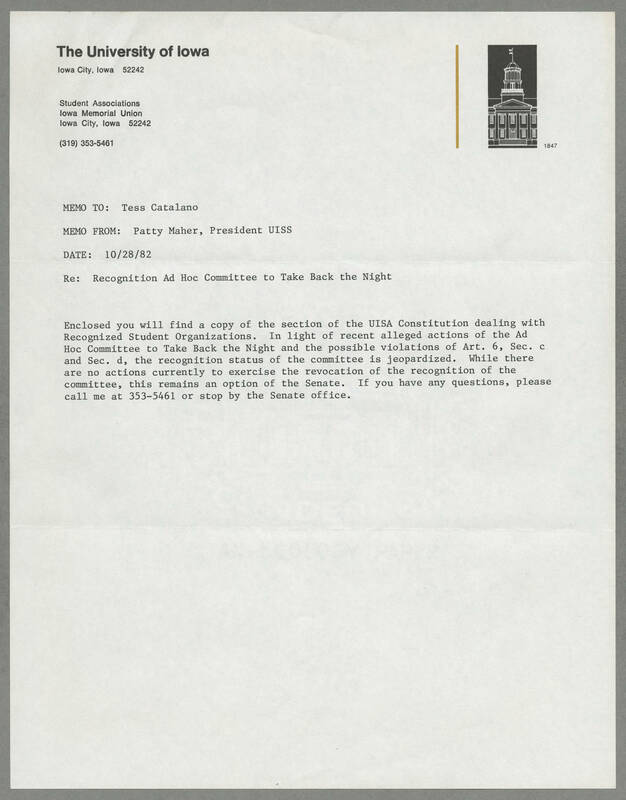 The University of Iowa Iowa City, Iowa 522422 Student Associations Iowa Memorial Union Iowa City, Iowa 52242 (319) 353-5461 1847 MEMO TO: Tess Catalano MEMO FROM: Patty Maher, President UISS DATE: 10/28/82 Re: Recognition Ad Hoc Committee to Take Back the NIght Enclosed you will find a copy of the section of the UISA Constitution dealing with Recognized Student Organizations, In light of recent alleged actions of the Ad Hoc Committee to Take Back the Night and the possible violations of Art. 6 Sec. c and Sec. D, the recognition status of the committee is jeopardized. While there are no actions currently to exercise the revocation of the recognition of the committee, this remains an option of the Senate. If you have any questions please call me at 353-5461 or stop by the Senate office.